"Sadly, even though I love the 909, it doesn't get used any more." Richie Hawtin: "The hardware - the 909, 808, 303 - was important, but we were also boiling things right down to basics." Whether he's releasing albums as Plastikman or F.U.S.E., touring his Decks, EFX & 909 live shows, collaborating with sculptor Anish Kapoor or performing at New York's Guggenheim Museum, Richie Hawtin has always tried to take techno to places new. And his latest project is certainly no exception: the 44-year-old producer has just re-scored the 1928 Dimitri Kirsanoff short silent movie Brumes d'automne. "I've been offered a couple of movie projects in the past, but they never felt quite right," explains Hawtin. "Generally speaking, the music I make is for me, and it's my opinion that counts, but a soundtrack is not just about the music. You've got music and a moving image, and you have to make them fit together… You have to make your emotions fit with the emotion on screen." 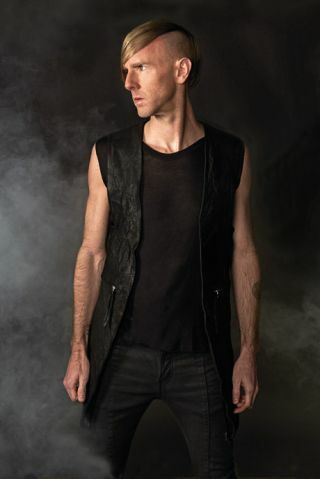 Born in sleepy Banbury, Oxfordshire, Hawtin moved to Canada when he was nine; specifically, to Windsor, Ontario, just over the border from Detroit. He still has his main studio there, but he's been operating out of Berlin for the last ten years or so and did most of the Brumes d'automne work on a Mac in the living room of his Berlin home. "At first, I didn't feel comfortable working 'in the box'. I thought that I couldn't be creative unless I was locked in a room full of hardware for a couple of months. But I've finally found out how to make it work: keep it simple and don't get lost in the machine. The best electronic music always happens when man and machine are collaborating. It's all about that struggle between human and computer." Is it true that your dad - obviously a very cool dad - introduced you to electronic music? "Yeah, that's kind of what happened. I have several very clear memories of my dad from when I was a kid. I can see him sitting at the kitchen table doing tech stuff: taking apart his hi-fi, building an early computer. Then, I can see him sitting in his favourite chair, listening to Kraftwerk, Tangerine Dream and the Electric Light Orchestra. Lots of synths and lots of weirdness. "Looking back, I kinda liked that weirdness. I liked the fact that not many kids in my school even knew who Nitzer Ebb were. I liked being in that slightly insular, electronic world, because it seemed to fit in with who I was. I did get a guitar one Christmas, but I never really played it, because I was way more interested in making my own bleeps and boings with a computer. With electronics, I didn't need to get my friends round, and I didn't need to form a band - I could make noises by myself." Was it a Commodore 64? "There were a lot of themes going on in my young head: Kraftwerk, New Order, 80s synth pop, computers, technology, messing around with my dad's old reel-to-reel machine, making a chip go 'boing', and then tying all that into an international kind of thing. It seemed to fuse my interest in the global electronic music scene." And, of course, you were living just over the border from Detroit. "Every night, I was hearing people like Jeff Mills and Derrick May on the local radio station. I was going out to clubs and seeing them DJ. There was a huge buzz in Detroit around 87 and the Summer Of Love in 88. I was hanging out with John Acquaviva, Kenny Larkin and Daniel Bell, and we were seeing all this happening right under our noses - we wanted to be involved." Did you 'instinctively' know how to make a techno track? "I'd spent years programming computers and, as far as I was concerned, programming a 909 was the same. It was a logical process. Sure, it was all trial and error in the early days, but eventually, you work out that if you can get your SH-101 talking to your 303 and your 909 and your Pro One, you could get something that sounded like the records you were hearing in the clubs. "The strange thing was that there weren't many computers involved in the Detroit scene. It was all about linking up the hardware - DIN Sync, CV, triggering this and that. It was very immediate, as if you were jamming with the machines. "When I eventually moved on-board for the Closer album , it was that immediacy that I missed more than anything." "I did get a guitar, but I never really played it"
"And Pro Tools is still a big part of my setup, but the journey from Closer to where I am today has been quite complex - it wasn't easy. "I suppose Closer was me experimenting and seeing what was available if I worked in the box. We all know that Pro Tools is an incredible editing tool, and it can be very, very creative when it comes to overlapping and inter-locking material that's already been recorded - it was the basis for all the Decks, EFX & 909 albums. But when it came to actually recording a 'new' album, it was a totally different kettle of fish. I got lost in the machine!" Too many plugins? Too much choice? "It's the classic studio mistake, isn't it? You've got a bit of money and suddenly all these plugins are within your grasp. You can have 20 reverbs and 50 compressors and 100 synths. You get drunk on the power! Ha! You need a bigger computer so you can run all these plugins at once. You need a plugin that will make this plugin sound a bit better. I became a collector… A collector of everything and a master of nothing. "And the truth is that it took me the best part of ten years to get around this new stumbling block. Ten years to realise I wasn't just in the box. I was trapped in the box!" "A lot of that ten years was actually spent outside the studio. I had more or less become a DJ, and making music became… Well, it wasn't the main focus of my life. I guess, in some ways, it was like getting back to the early days. Back then, releasing a record didn't pay the bills. Running the [M-nus] record label didn't pay the bills. They were passions; things I did for fun. It was DJing that brought in the money. That was my 'job'. "As soon as I realised I was back in that same position, it allowed me to start thinking about music as fun; music as a passion. I was able to stand back - literally and psychologically - from the mixing desk, and ask myself what was going wrong. Why wasn't I enjoying making music? "I liked the fact that not many kids in my school even knew who Nitzer Ebb were." "I thought about those late-80s years and asked myself, 'What were we doing that was different?' And the answer was simplicity. OK, some people argue that that era was all about the hardware, but I don't agree. The hardware - the 909, 808, 303 - was important, but we were also boiling things right down to basics. Two or three machines, maybe an effects box, and you could create a track. If there was a problem, you found a way around it or you decided it wasn't really a problem. We made it work and, from that simple era, there emerged some classic musical moments. "Over the last 18 months, I've tried to adopt that attitude for a computer-based setup. What's the bare minimum I need to start playing and to start having some fun?" So what's on the Hawtin computer? "Pro Tools and Ableton [Live] are my main platforms. I create and record in Ableton, then play it back in Ableton - jamming and tweaking - to be captured in Pro Tools, ready for editing and mastering. Ableton is my band and my bunch of vintage hardware boxes; Pro Tools is my reel-to-reel tape machine." You said that you went a bit bonkers with the plugins and add-ons. Have you ditched all the third-party stuff since then? "Well, I'm a big 303 fan, and I definitely needed something for when I was playing live. For a while, I was using the AudioRealism Bass Line, but on the last album, I went back to the D16 Phoscyon. Depending on the sound I'm after, I'll use one or the other, or even both layered up together. "Some of the legacy effects that are around now have gotten very close to my heart - the Lexicons and the Eventides. Then there's Traktor, of course, for the live setup. But the rest is pretty much the native doo-dahs that you can find on Ableton and Pro Tools. "OK, it's the same software that everybody else is using, but I don't see why that should be a problem. Back in those early days, Derrick and Jeff and Kevin [Saunderson] and Aphex and LFO and me and all the other guys were using the same equipment, but we were able to weave those elements together in a way that created our own individual musical tapestry. That's what I try and do in Ableton and Pro Tools: chain those building blocks to create unique sounds." Where do the drums come from these days? Do you still use the real thing? "Samples! Sadly, even though I love the 909, it doesn't get used any more. You need a bit more punch, plus the ability to detune and automate. I still prefer to program in a step sequencer, though. That's one habit I can't break. I hate the idea of throwing chunks of drum audio onto the arrange page and then shifting them around. I like to hit buttons… that's how I like to interface with my machinery. "For me, two of the greatest modern inventions are Ableton Push and Native Instruments Maschine. They remind me of the old days, but they allow me to work in the digital domain. I don't know how people feel about that subject of 'interfacing with the computer', but I consider it vitally important to how comfortable you feel in the studio. A row of 16 buttons allows me to do what I need to do. "Interfacing with my 303 software has been a bit of an issue over the years. Just recently, I took apart one of my old Roland machines and started toying with the idea of making a custom gadget that allows me to control the computer with the familiar feel of that silver box." Some people might wonder why you don't just go back to hardware. "No, no, no! That's not what I'm talking about here. I'm not precious about the past. This is just about rediscovering… attitude and inspiration. The 808 and 909 and 303 had their moment, and they're still wonderful machines, but let's try and capture that spirit in 2014. "Closer was me seeing what was available if I worked in the box"
"When I listen to my favourite records, I'm always amazed at how basic and simple they are; the subtle interplay between sound and space, reverb and delay. Back then, there was no real choice to make about your bass sound or your kick sound because all you had was what was coming out of the box. "That's what I'm trying to achieve with a computer. At the end of the day, it shouldn't be about whether you've got the super-duper this or the singing-dancing effects package - it's about sitting in front of a computer and capturing a moment that matters."